My least favorite job? How about the job the ensured my completion of college!! It was summer 1982 and I got a job working at the Jafra Cosmetics and Perfume factory in Westlake, California. I thought, how hard can it be to work on a production line?! I’m smart and athletic…outta my way!! I was put on the line where the spray tops are put on the perfume bottles. This is done buy hand…seriously…this skill is not in my wheelhouse. I started by watching this woman pop these tops on super fast…boink, boink, boink. Then travel to the end where another lady puts them in a box. I’ve got this! No problem I am thinking. 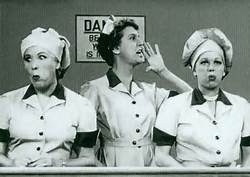 However, this is not like on I love Lucy where you can eat the chocolate. Have you ever tried to put on a spray top? It takes precision and calm. I didn’t have either of those things. The bottles were moving down this belt, I have the tops in front of me and I already feel panic. I tried and tried. They had to keep stopping the line and help me catch up. I managed to kill four hours of their time. I do believe I had my first panic attack ever. While I was eating lunch with my coworkers, they were telling me how they had been doing this same job for 5 to 10 years. I went to the manager and said this is not for me. I finished out the summer in the shipping department filling orders. I love the Jafra products, but I needed a different kind of challenge when it comes to work. I eventually had a job working in my field of study and worked my way through school, while raising a family. It took until 2000 to finish, but I did it. I said to my current boss, that sometimes being stubborn is good. She refers to it as “unending determination.” I like that and was thinking about adding it to my resume under skills. Today I have one class and the CPA exam in order to have those letters after my name. I watched my boss go through the process of getting her CPA and bottom-line she didn’t see the payoff at this point in our careers. I toy with the CPA thing, but I have to figure out what will make me happy, not what will people see on my resume? I have the same amazing skills now as I would if I finished. I am grateful that I did finish my education and I have had a great career so far. Thank you Jafra for lighting my path.